Obituary for Major Willis Lewis Canaday, US Army Ret. | Bryant Funeral Home, Inc.
Major Willis Lewis Canaday, US Army Ret. 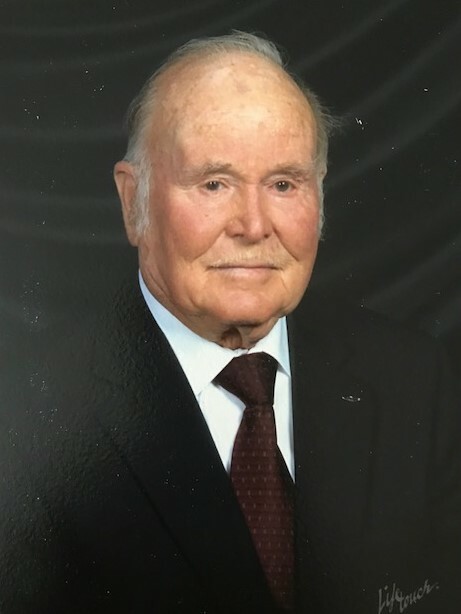 Major Willis Lewis Canaday, US Army Ret., of Harleyville, husband of Lois Canaday, entered into eternal rest on Saturday, July 7, 2018 at his residence. Funeral Services will be held 11:00 AM, Friday, July 13, 2018 at Memorial Baptist Church with the Rev. Dr. Clay Shook officiating. Burial with Military Rites will follow in the Harleyville Cemetery. Pallbearers will be Lawrence Snipes, Bradley Smith, Skyler Zane, Ben Parler, Gregory Van Bebber and Jimmy Christopher Bailey. Honorary Pallbearers will be members of the Wilson Patrick Sunday School Class. Visitation will be Thursday evening from 6:00-8:00 PM at Bryant Funeral Home, St. George. Major Canaday was born in Byrds, SC on June 17, 1926, a son of the late Andrew Willis Canaday and Estelle Hilton Canaday. After graduating from high school, he joined the Maritime Service and pulled two years until the war ended (WWII). He stayed on the family farm until he was drafted. He took basic training at Fort McCelland, Alabama and was assigned to Fort Bragg, NC. He applied for and was accepted to various aviation mechanics schools. He attended Leadership training at Fort Jackson, SC and was accepted to OCS and sent to Fort Riley, Kansas where he graduated and went for further training. Major Willis was accepted, while attending Ordinance Basic Course, in the Army Aviation Flight School. He later attended Spartan School of Aeronautics and obtained a maintenance officers MOS. He was assigned to 45th Transportation Maintenance Company in Wonju, Korea. After 18 months, he returned to Fort Riley and was assigned to maintain CH21 helicopters. After 2 ½ years, he then went to 8th Trans Bn. In Munich, Germany with Helicopter Pilot training in route. After 3 years, he was then assigned to 593rd at Fort Benning, flying and maintaining the Ch-37. After 2 ½ years, he received orders for Vietnam which were cancelled and I was sent to Korea for a second tour. He returned to Corpus Christy Aeronautical Depot as Chief of Production’s Central Shops’ Operation Officer and Project Manager for CH54s maintenance capability. He retired in May 31, 1966 after 20 years of service. He was in the Farm Equipment business for 15 years and sold the business and retired to the 14 acre Christmas Tree Farm which he operated until 2006. He was a member of the Memorial Baptist Church where he was an ordained deacon, American Legion past president and a Mason. He was predeceased by his first wife, Catherine Cummings and siblings, Myrtle C. Fry, Wilbur S. Canaday, James Donald Canaday, Clarene Quattlebaum and a foster sister Billie C. Looney. Surviving is his wife of 24 years, Lois Monroe Canaday; four daughters, Brenda Gale Vaughan, her husband Major (USAF Ret.) Samuel Vaughan; Catherine Van Bebber, her husband, John Van Bebber; Nancy Micksch, her husband, David Micksch; Jennifer Zane, her husband Kimton Zane. Also surviving are step-children, JL Snipes, his wife, Louise; Lynn Snipes Blaylock, her husband Dennis Blaylock. There are fifteen grandchildren and 11 great-grandchildren. In addition are a God-Child, Noah Herndon and his parents, James and Angelia Herndon, their son and daughter Khloe and Chase. Memorials may be made to Memorial Baptist Church, Missions Fund, PO Box 566, St. George, SC 29477.